Fundación ProAves has publishes selected papers from the 19th volume of its scientific journal Conservación Colombiana. 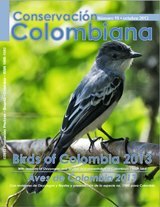 This edition includes no less than six scientific papers discussing records of new bird species for Colombia, plus its now annual paper on revisions to Checklist of the Birds of Colombia. Revision of the status of bird species occurring or reported in Colombia 2013. Conservación Colombiana 19: 3 – 10. Download here. Vocal variation and species limits in the genus Sirystes (Tyrannidae). Conservación Colombiana 19: 11 – 30. Download here. The taxonomic and conservation status of the Oxypogon helmetcrests. Conservación Colombiana 19: 31 – 38. Download here. First confirmed records of Kelp Gull Larus dominicanus and Dunlin Calidris alpina for Colombia. Conservación Colombiana 19: 39 – 41. Download here. First mainland record of Caribbean Coot Fulica caribaea for Colombia. Conservación Colombiana 19: 42 – 43. Download here. An escaped, threatened species: Java Sparrow Padda oryzivora in Quindío, Colombia. Conservación Colombiana 19: 44 – 46. Download here. Instructions for authors. Conservación Colombiana 19: 44 – 49. Download here.